Aluminum, silver-white light metal with ductility. Commodities are often made into rods, flakes, foils, powders, ribbons and filaments. Aluminum relative density is 2.70. Melting point 660 C. Boiling point 2327 C，Aluminum is the most abundant metal element in the crust which ranking third only after oxygen and silicon.With the development of aviation, construction and automobile industries, material properties are required to have the unique properties of aluminium or its alloys. Aluminum and its alloys are one of the most widely used and economical materials nowadays.The smelting of metal aluminium is an important procedure in the production and processing of aluminium products.In fact, the so-called smelting is to put a certain proportion of the metal burden in the furnace, through different heating methods to melt the scrap aluminum , and then cast into the corresponding products.There are mainly three types of aluminum furnaces adopted to melt the aluminum.1.Resistance metal melting furnace, gas-fired metal melting furnace and medium frequency induction furnace are usually used to melt scrap aluminium in aluminum foundry. During the melting process of cast aluminum alloy, the liquid aluminum will react with the hydrogen produced by the water vapor and dissolve into the liquid aluminium.If the content of hydrogen in the liquid aluminum is too high, it is easy to form Blowhole in the aluminum castings, and the mechanical properties of the castings will be reduced. More seriously ，the castings will be scrapped. So Hydrogen is a harmful gas in molten aluminum. detection of hydrogen content in molten aluminium is an important procedure to ensure the quality of castings.Especially in the mass production of large capacity , the use of liquid aluminum Degassing and slag remover will become indispensable. The working principle of the Aluminum liquid degassing and slag removal refining machine is that the rotating graphite rotor breaks the inert gas (argon or nitrogen) into a large number of dispersed bubbles and disperses them in the liquid aluminium.Bubbles in molten aluminium absorb hydrogen in molten aluminium and adsorb oxidized slag by the principle of partial pressure difference of gas and surface adsorption, and are brought out of the surface of molten aluminium with the rising of bubbles. The liquid aluminium can be purified; because the bubbles are fine and dispersed, they mix with the rotating melt evenly, and then rotate in a spiral shape and float slowly. When contacting with the liquid aluminum, there will be no continuous straight upward air flow.Thus, the purification effect is significantly improved. The degassing medium is recommended to use more than 99.996% of the nitrogen or argon (considering the cost, nitrogen is recommended).The whole degassing system is installed on a movable cart, which can degasser the liquid aluminium in different positions conveniently.Because its graphite rotor can rise and fall up and down, it can provide degassing for almost all types of furnace body. It can be designed into movable and fixed models, which are suitable for different operating environments and types aluminum smelting furnaces. High degassing rate which can shorten the smelting time and reduce production cost. Hydraulic or chain lifting devices can be designed make the graphite rotor positioning and easy to replace. Nitrogen or argon is adopted as degassing medium ,the advanced degassing principle greatly reduces degassing time, improves efficiency, reduces refining cost, and has no pollution to the environment which greatly improves working environment. aluminium material charge →melting (adding copper, zinc, silicon, etc.) →remove scraping slag→ adding magnesium, beryllium → stirring →sampling →adjusting composition →stirring →refining→ Scraping Slag→ converter refining modification and static casting. According to the usage purpose and process requirements, there are three main types of aluminium smelting furnaces on the market. A low cost, efficient method for melting aluminum& other non-ferrous metal. Melting aluminum using electric resistance heating furnace can be low-cost choice, as well as providing complete freedom from the noise and excessive heat of combustion processes. This heating method also results in a high quality melt with low oxidation losses. Resistance furnace are often capable for smaller melting foundries,whose investment funds are limited and no need high production rates. Gas-fired metal melting furnaces are ideal for melting Aluminum,Zinc, Lead,Tin,Copper and other nonferrous metal.The melting time takes about 2.5 hours for each batch, and the gas melting furnace can be designed as station type furnace body or hydraulic titling furnace body, this type furnace is very suitable for the client who have abudance gas resource. With natural gas and liquefied gas as fuel, the workshop is clean and safe, and easy to manage. Compared with electric heating crucible furnace, it has the advantages of high thermal efficiency which can melt to a higher capacity, low operating cost &low energy consumption, thus completely eliminating the cost of replacing the electric heating elements. Adopt new technology burners which can make diesel completely burnt, exhaust emissions completely free of pollution, multiple heat flow channel design, make full use of the energy generated by the burner, greatly improve the thermal efficiency, energy saving effect is remarkable. Using dual temperature control system, automatic temperature control, automatic melting, automatic insulation, and on-site temperature detection of molten metal is available,The furnace is equipped with a leak alarm device. If there is leakage of aluminum liquid, it can immediately alarm, and the user can take timely measures to reduce the loss to a small value. There are two types of crucibles used in smelting aluminium alloy, one is graphite crucible with high strength and fire resistance, and the other is cast iron crucible. Graphite crucible is produced by professional refractory factory. There are many specifications of crucible size and capacity. Graphite crucible can be easily replaced and used many times, but its overall lifetime is relatively short. What is more,With the increase of service time, the thermal conductivity of the crucible decreases, affecting the thermal efficiency and production efficiency. Because the melting temperature of aluminium alloy is low, mostly between 700 and 800 C, metal crucibles are widely used.cast iron crucibles are widely used in production because of their low price, high strength and good thermal conductivity, but their service life is short and crucibles are frequently replaced in production. In order to improve the service life of cast iron crucibles, crucibles containing nickel, chromium or aluminium can also be used to increase their service life. The capacity of cast iron crucibles for melting aluminium alloys is mostly 30-250 kilograms, generally not more than 300 kilograms, and the largest capacity can reach more than 500 kilograms. Aluminum Induction furnaces offers the modern foundry a clean, efficient, cost-effective melting system with all the advantages of state-of-the-art technology and environmental protection. The equipment is of proven technical design to deliver high performance. Design configurations provide versatility in the installation and are user friendly to operate. Cdocast can provide 50k,100kg,200kg,500kg 1000kg,2000kg,5000kg aluminum induction furnace. With strong electromagnetic stirring force, the aluminum liquid has been tumbling during smelting, and it is easier to go out of the aluminum slag in the aluminum liquid. Induction aluminum melting furnaces offers the modern aluminum foundry a clean, efficient, cost-effective melting system with all the advantages of state-of-the-art technology and environmental protection. The equipment is of proven technical design to deliver high performance. Design configurations provide versatility in the installation and are user friendly to operate. Aluminum ingot casting machine is an important equipment in the aluminum foundry . First the molten aluminum liquid flow through the melting furnace, go through the launder and flow into the distributor of the casting machine,can distributor can make the molten liquid into the ingot mold evenly, cooling system is installed in the casting machine which can help the aluminum ingot cooling fast, thus we can cast the aluninum ingot continuously . 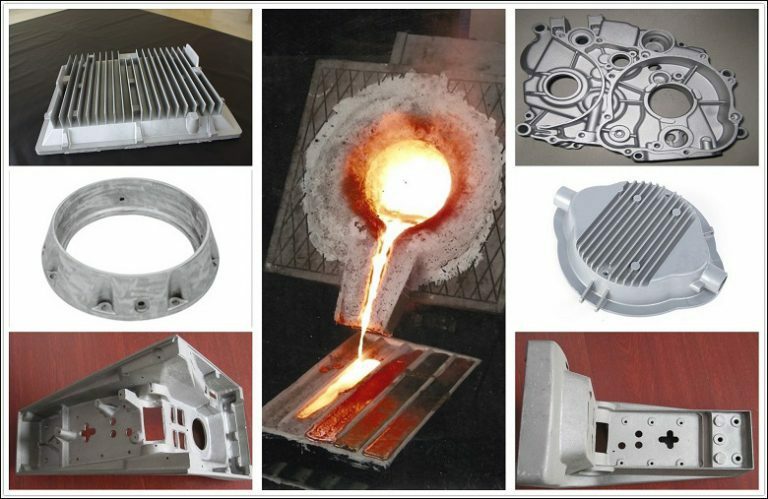 The ingot mold can be custom-made according to client requirement,and the conveyor belt speed can be adjusted, and the length of the conveyor belt is designed according to the melting capacity, the bigger capacity the furnace is, the longer the conveyor belt will be ,and also the conveyor should designed considering the cooling time.